I purchased these pizzas and had them for lunch and dinner over the weekend. Were they worth my money? 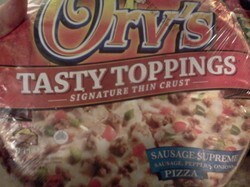 Product Description: Frozen pizza from the Orv’s brand. The pizza offers a variety of topping combinations and advertises a signature thin crust. I purchased three of these pizzas at one of our local grocery stores this past weekend for $4.98 and ended up making the cheese pizza for lunch on Saturday and the Sausage Supreme pizza last night for our family dinner. Even though we eat frozen pizza often, we rarely eat it two days in a row. However, this past weekend was definitely one of those exceptions because we had a lot going on at once and just didn’t have time to plan out any sort of meal that required us to actually cook. We purchased pizzas from the Orv’s brand because it happened to be on sale and I won’t pass up the opportunity to buy three of any pizza for less than $5, especially since we do go through so many of them. And, for the most part at least, we did enjoy this purchase. One thing I found I did not like about this pizza from the start was the thin crust. Overall, I don’t like thin crust in general. However, I have been known to make exceptions for some pizzas. This is definitely not one of those. The crust was paper thin and, while the Sausage Supreme pizza turned out OK in our pizza oven, the cheese pizza we made the day before just didn’t get crispy and the crust even tore when we were trying to cut it. That being said, I do think we enjoyed these pizzas. Again, the thin crust could have used some improvement. However, the Orv’s brand did make up for that a bit with the toppings. The cheese pizza had more cheese than I would normally expect from a frozen brand and the Sausage Supreme pizza we cooked last night had a decent quantity of sausage and peppers on it. Granted, I probably could have gotten more toppings (and a better crust) had I purchased another brand. But, that would have cost me considerably more money. I also thought the sauce on this pizza was better than expected. It wasn’t bland like many other bargain-priced pizzas and I did like the seasonings in it. Again, I might have found something a little better tasting had I spent more money. But, given what these pizzas ended up costing me, I thought it was more than acceptable. These pizzas aren’t perfect. However, they were very affordable and, when that is taken into consideration, I do think they offer good value for the money. I may not be a big fan of the thin crust. But, I would purchase this brand again. I just had an Orv's Tasty toppings Signature thin crust Pizza and there were only 13 small small small pieces of sausage....the sauce had no flavor and hardly any cheese. So by the time added mushrooms cheese and onions it costed me more that if I would have went out to eat one. Terrible!!!!!! 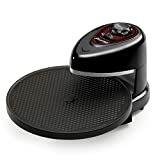 I will never buy one again. they used to be so good, what happened??? I purchased this pizza last night as an easy meal for my daughters. Read to find out if it was worth my money.